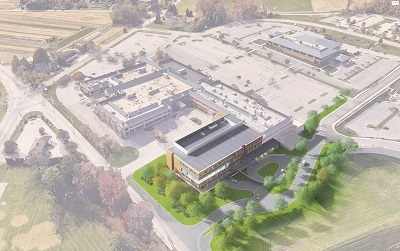 Architectural renderings of the facade (top image) and aerial view (bottom image) of the proposed WellSpan York Cancer Center expansion are shown. Groundbreaking is expected to occur in late summer or early fall 2019, with completion by early 2021. WellSpan Health today announced plans to significantly expand its WellSpan York Cancer Center at the Apple Hill Health Campus, offering comprehensive, integrated cancer care in one convenient location. “Today is an exciting day for WellSpan and for the residents of our region, as we announce a major investment that will strengthen WellSpan’s highly respected oncology program,” said Roxanna Gapstur, Ph.D., R.N., president and CEO, WellSpan Health. 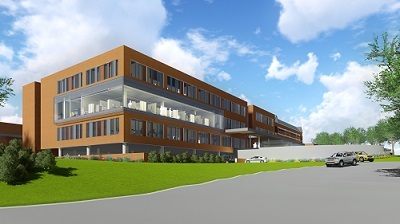 The project will include an approximately 67,100-square-foot addition to the current WellSpan York Cancer Center. Once completed, the new cancer center will boast nearly 84,000 square feet of space – all under one roof. The estimated cost of the project is $45 million. The project is currently in the design phase, and regulatory approvals are in process. Groundbreaking is expected to occur in late summer or early fall 2019, with completion by early 2021. The new cancer center will consolidate several oncology services currently provided at multiple locations in the York area, including: radiation oncology, outpatient infusion, infusion pharmacy, clinical trials and research, patient navigators and social workers, among others. Officials noted that the new facility is intended to provide an array of services that cancer patients may require on their care journey. As an example, the new WellSpan York Cancer Center will include holistic care through the WellSpan Center for Mind/Body Health, including massage therapy and yoga. New to the center will be an “appearance center and boutique,” which will provide specialized items in a supportive environment. Also new will be an on-site café and a conference space for classes, therapeutic activities, support groups and community education. Treatment rooms will be equipped with reclining chairs, temperature controls and other features. Infusion bays will include private spaces for loved ones to stay with patients during treatment. WellSpan’s coordinated network of regional cancer care includes centers in York, Hanover, Gettysburg, Chambersburg, Ephrata and Lebanon. WellSpan Cancer Centers provide comprehensive cancer services – including radiation, medical and surgical oncology, pain management, rehabilitation, infusion services, genetic counseling and nutrition services – that address patients’ physical, emotional, social and financial needs. Specialists across central Pennsylvania routinely collaborate in the treatment planning for patients, and nurse navigators guide patients through all aspects of care. WellSpan also collaborates with the Johns Hopkins Sidney Kimmel Cancer Center and the Maryland Proton Treatment Center. For more information, visit WellSpan.org/Cancer.